Glynis Casson and Daniel Costello are performing “Yeats’ Women” in Christ Church Hall Sandymount on Sunday 18th October at 7:30pm to celebrate the 150th Anniversary of Yeats’ Birth in Sandymount this year. The Show is written by Glynis and tells the story of the lives of Yeats and the women who influenced him, supported him, inspired him, loved him and who also rejected his love.It will be illustrated with Yeats’ Poetry, some of which is put to music and sung with harp accompaniment by Claire Roche. There will be two other performances in “Woodford House” Booterstown Park on the 7th and 15th November. They have also been invited to perform “Yeats’ Women” in Thoor Ballylee,” Yeats’ famous Tower near Coole Co. Galway, in the Spring next year. 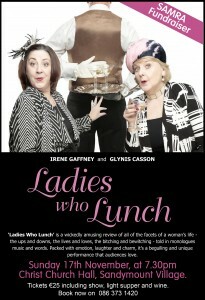 ReActor Glynis Casson took to the stage last night with her wickedly amusing review of all of the facets of a women's life - the ups and downs, the lives and loves, the bitching and bewitching - told in monologues music and words. ReActor Glynis Casson is the voice of Mrs Bonner in the NEW animated series on RTÉjr - NELLY AND NORA. This series follows the adventures of two young sisters who spend their holidays and weekends with their parents at the family’s mobile home in a camping park by the sea. You can catch the latest episodes on http://www.rte.ie/rtejr/nelly-and-nora/. 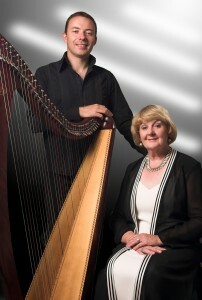 Glynis Casson will be performing her Recital "The Harp that Once" with well known harpist Cormac de Barra in Castletown House for Heritage Week on Wednesday 27th August at 8pm.